‘Inside Out’ is comfortably one of the best films of the year, and it’s another stellar entry to the ever impressive Pixar resume, at a period when people were perhaps beginning to question whether their best times were past after several sequels and the lesser ‘Brave’. ‘Inside Out’ is an emphatic response to those doubts, and it’s a further example of the incredible work this animation studio can produce. The premise behind ‘Inside Out’ is so insanely clever that it’s a surprise that it hasn’t been thought of before, and in Pixar’s hands, the world is so intricately created, the voice cast is superb and the production design is outstanding. The film tells the story of 11 year old Riley, a young girl who is about to move to San Francisco with her parents, leaving her friends, her hockey team and many good memories behind. We see this story play out from inside Riley’s head, where the five core emotions (Joy, Sadness, Fear, Disgust and Anger) debate on the best way to help Riley settle into her new surroundings. The film is genuinely moving and emotional, drawing rich comparisons between the ‘emotions’ as Riley moves from childhood to her teenage years whilst trying to cope with moving to a new city. This is ambitious, imaginative stuff and it should come as no surprise that Pixar deliver on every front. The world building is superb, with the production team creating an intricate web of memories inside Riley’s head, showcasing the control room with her core emotions battling for control, the various memory stores (long term, core etc) and such clever ideas as the ‘train of thought’, ‘dream production’ (which doubles as Hollywood, because of course it does!) and the personality islands of ‘family’, ‘friends’ and other important strands. Our memories are what make us who we are, and the creator’s tap into this feeling of nostalgia to create rich, emotional stakes. Who can’t be affected by the feeling of a lost memory, struck down to the abyss and forgotten for ever? This is epitomised by Riley’s imaginary friend Bing Bong (Richard Kind), a bouncy elephant who exists in stasis, a character no longer relevant in Riley’s life as she grows older and matures. 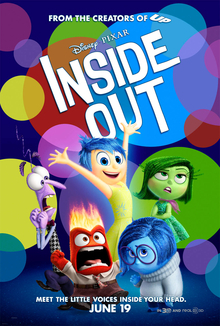 To bring this world to life, ‘Inside Out’ assembles an incredible voice cast, from the bubbly Amy Poehler as ‘Joy’ to the real find of Phyllis Smith (who most will know as Phyllis from the US Office) as ‘Sadness’. The relationship between ‘Joy’ and ‘Sadness’ is the core relationship that the film develops, and it allows the film to delve into such complex themes as the nature of memory and how good, happy memories can make us feel sad in certain circumstances. This is all supported by terrific observations that are incredibly on the nose and ultimately, ‘Inside Out’ is a frank and remarkably insightful look at what it means to be human. The smart humour throughout draws on a rich palette and understanding of human behaviour, both in adults and in children, and there are some terrific comedic moments that range from slapstick, one-liners to a running joke with an old advert theme tune (echoing the irritating experience of a song getting trapped in your head!). The brief glimpses inside Riley’s parents heads show that an ‘adult’ version of this premise could be equally promising, with a keen observational look at husband and wife dynamics which is both absurdly funny and scarily realistic (at least for my partner and I, and we’re not married!). Pixar have always excelled at tapping into our emotions, whether it’s through a lonely robot (‘Wall-E’), toys that come to life (‘Toy Story’) or an old man reflecting on his life (‘Up’), and ‘Inside Out’ builds on the themes developed in those films to really dive inside our heads to tell a thoroughly rich, compelling and emotional story about growing up and developing new memories. I can’t state highly enough just how good ‘Inside Out’ is and it is absolute must-see cinema for all ages.